My big sister came into town for less than a day, to audition for a ballet company here in Philly. She got out early- so i met her in center city for lunch. I asked Weegie, resident food guru for a suggestion, since i don't eat out alot. He pointed me towards Smokin Betty's. It's on 11th and Sansom (no website yet) Decor is cute, simple, and what do you know, Brooks was our server! We ordered a salad and the pizza special and split them. The food was SO delicious!!!!! 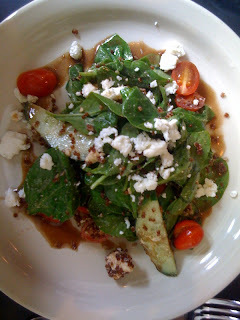 The salad was a quinoa, chickpea salad with feta, cucumbers, tomato and balsamic vinaigrette. YUM. 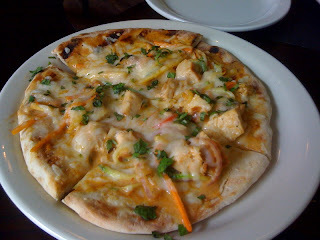 The pizza was a curry, grilled chicken with cilantro and cheddar cheese. delicious! I also got a Saranac pomegranate wheat beer which was nice and refreshing after my bike ride down. 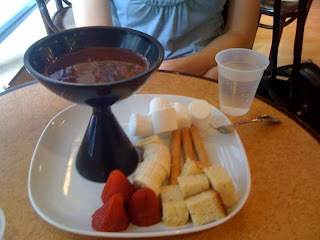 Then we headed to Naked, and split a fondue thing. All together- quite a nice day! This sounds like the yummiest. Looks good, I'm glad there are some vegetarian options.